That’s right, I wrote beauty. 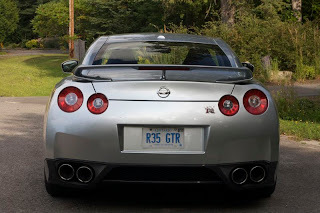 From the photos, many judge the GT-R as an ugly duckling, but from my unscientific poll of the dozens of people poring over the car at work today, I’d say the GT-R is one of those cars that is just not photogenic. It really is striking in person. Personally, I like the side profile best: it reminds me of a fighter jet. ..but there is still nothing that can prepare you for the sheer exhilaration of mashing the throttle for the first time in the GT-R. I can tell you it is fast (oh, and it is), but until you feel your stomach in your throat — unfortunately, you just won’t get it. I think its pretty fast from the drivers seat, but scary from the passenger side. I have driven a few 500, 600, 700 wheel horsepower cars. The GT-R feels like it is, a 400 whp car. Thats a fast car. In real life though, with the quick shifting, it adds up to be a little quicker than a 400 whp , 3800 lb car.